For Android applications, Material Components for Android (MDC Android) unites design and engineering with a library of components for creating consistency across your app. 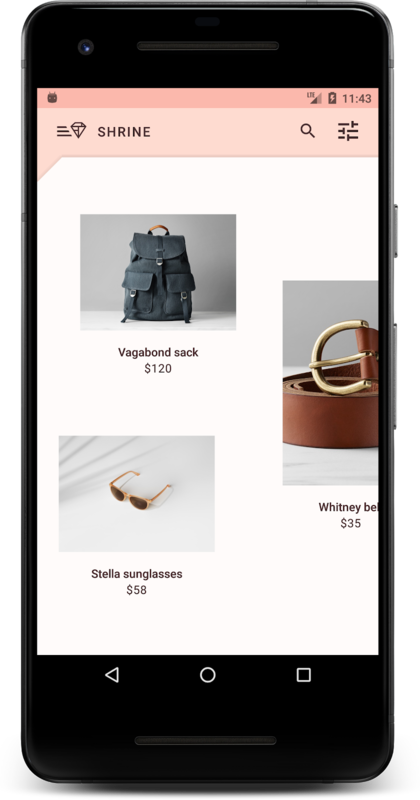 As the Material Design system evolves, these components are updated to ensure consistent pixel-perfect implementation and adherence to Google's front-end development standards. MDC is also available for the web, iOS, and Flutter. 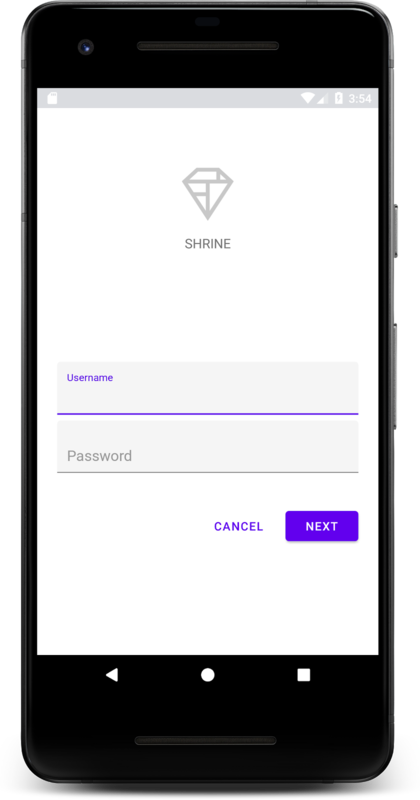 This codelab is the first of 4 codelabs that will guide you through building an app called Shrine, an e-commerce Android app that sells clothing and home goods. 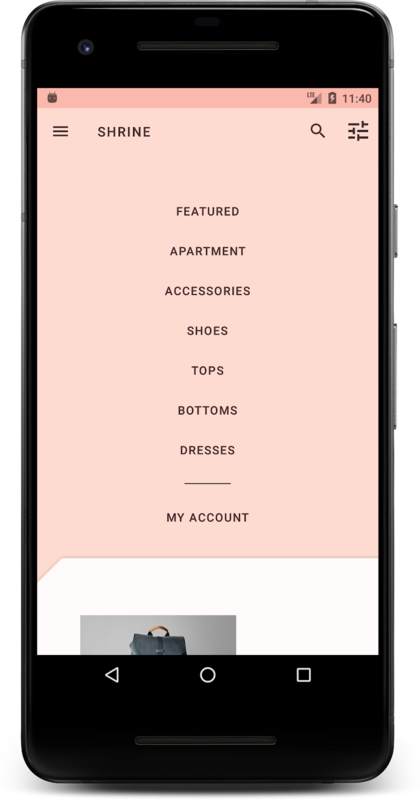 It will demonstrate how you can customize components to reflect any brand or style using MDC Android. The starter app is located within the material-components-android-codelabs-101-starter/kotlin directory. Once the setup wizard finishes and the Welcome to Android Studio window is shown, click Open an existing Android Studio project. 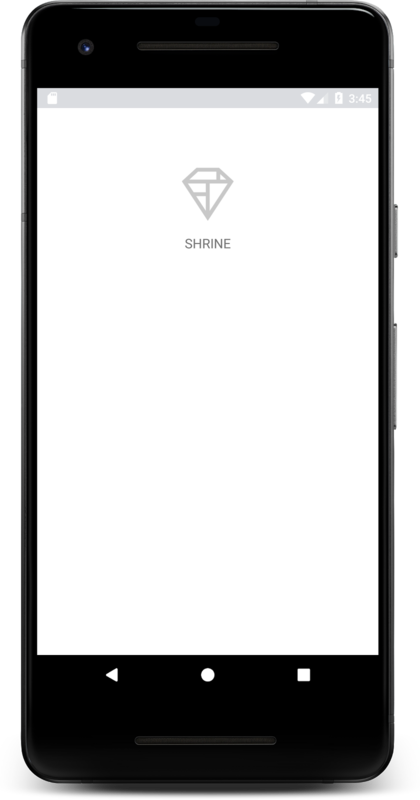 Navigate to the directory you installed the sample code in, and then select kotlin -> shrine (or search your computer for shrine) to open the Shrine project. At this point, Android Studio might raise some build errors because you are missing the Android SDK or build tools, such as the one shown below. Follow the instructions in Android Studio to install or update these and sync your project. (Optional) If necessary, edit the build.gradle file to add the following dependencies and sync the project. You can see that in onCreate(), MainActivity.kt starts a Fragment transaction in order to show the LoginFragment. For this codelab, we'll be modifying LoginFragment. The activity also implements a navigateTo(Fragment) method, defined in NavigationHost, which lets any fragment navigate to a different fragment. Here, we see a simple <FrameLayout> which acts as a container for any fragments the activity displays. Next, let's open up LoginFragment.kt. LoginFragment inflates the shr_login_fragment layout file and displays it in onCreateView(). Now, let's take a look at the shr_login_fragment.xml layout file to see what the login page looks like. Finally, we'll add some Kotlin code to LoginFragment.kt to hook up our "NEXT" button to transition to another fragment. Then press "Sync now" to sync the changes with Gradle. Now we're ready to add some Kotlin code! Now let's add a key listener to the password TextInputEditText to listen for key events that would clear the error. This listener should also use isPasswordValid() to check whether or not the password is valid. You can add this directly underneath the click listener in onCreateView(). // Inflate the layout for this fragment. // Navigate to the next Fragment. We've added the line (activity as NavigationHost).navigateTo(ProductGridFragment(), false) to the else case of the click listener. This line calls the navigateTo() method from MainActivity to navigate to a new fragment -- ProductGridFragment. Currently this is an empty page which you'll work on in MDC-102. 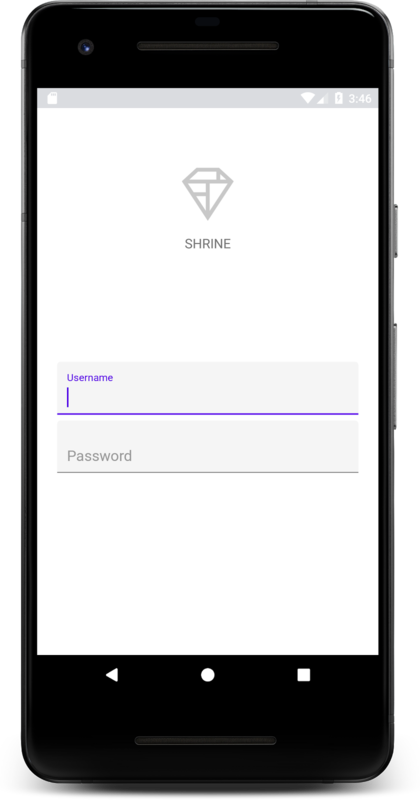 Using basic XML markup and ~30 lines of Kotlin, the Material Components for Android library has helped you create a beautiful login page that conforms to the Material Design guidelines, and also looks and behaves consistently across all devices.